Now Personalized with Single Initial. Get the perfect cut every-time with 6 blades to help trim away that pesky foil top. 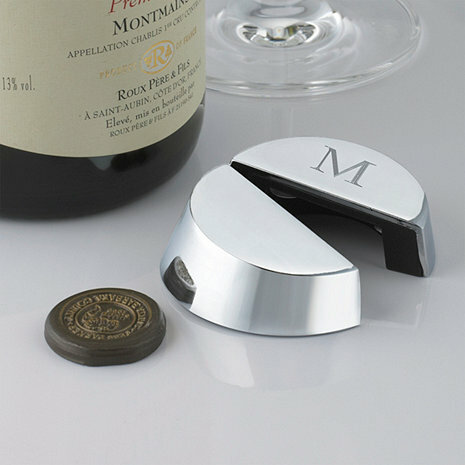 The six stainless steel wheel blades make cutting the foil on your wine bottle a cinch! Elegant and easy to grip round design. This is by far the BEST cutter we have ever bought! Six blades do the trick !! The choice of one letter is lame instead of a true monogram and the quality is quite bad. I'll be surprised if it lasts one year. The item in question was a gift for a neighbor. He was amazed by it. Bought many as customer gifts and kept a few for myself. I would make this a 10 star plus it is that good. So happy I found this!! Have purchased as gifts this Christmas! This photo cutter is everything promised in the ad and more. Looks great works great we love it. This is an excellent foil cutter. the 6 wheels smoothly cut foil. The longevity of the device is yet to be determined so a 5 star rating cannot be assigned. it is well weighted. it is a pleasure to use. Cuts quite nicely and smoothly. Love the weight. Have not had it long enough to know how well it will last. Love the monogram. I was very disappointed in the wine opener. It is very rickety and wobbly. I would not buy another. I am very sorry for the trouble, and wanted to let you know that I am sending you out a replacement! I hope this helps! Cheers! First bottle I used it on one of the tiny screws fell out of the bottom. I tried to put it back in but the threads are stripped. The cutter is very loosely put together.